Torrential monsoon rains in Bangladesh, India, and Nepal have already taken 1200 lives, and left millions homeless and internally displaced in South Asia. 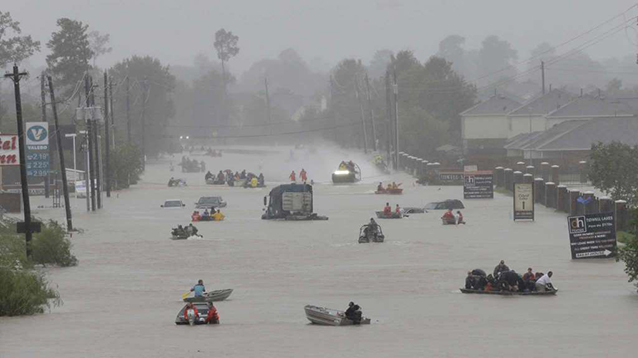 A third of Bangladesh is under water; Hurricane Harvey has slammed the Texas and Louisiana Gulf Coasts, where it has continued to rain, resulting in the worst flooding in Texas history and the worst rainstorm in U.S. history. Much of Houston, the United States’ fourth largest city, is still flooded. Hurricane Harvey has caused a tragic disaster in Houston. What is happening in Houston, like what happened to New Orleans during Hurricane Katrina and its aftermath, has powerful lessons to teach us about race, immigration, class, gender, poverty, the crisis of climate change and the environment, government, and private “security.” In South Asia, echoes of previous recent monsoons and other disasters (Cyclone Sidr in 2007 for example) haunt those living in marginal hazard-prone areas. Flooding has submerged twenty districts out of 64 in Bangladesh. Multiple forms of marginality intersect, compounding hardship and increasing the vulnerability of people to the whims of government, industry, and NGOs. Nature might not discriminate, but systems and institutions do. In North America, South Asia and throughout the world, “disaster capitalism” profits. Of course, capitalism itself is a disaster for humanity. Moments like this show just how brutal capitalism is–today more than ever. The warming of the oceans adds to the ferocity of storms, as evidenced in Harvey’s rapid unforeseen development to Category 4 hurricane status and in phenomena like the weakening of the jet stream that kept it hovering in place day after day. “Climate change” are the forbidden words unspoken by the corporate media, including the ostensibly liberal ones. Uncontrolled sprawl resulting from “free market” policies have exacerbated the conditions in Houston. In the leadup to the hurricane, immigration checkpoints left many undocumented people in Texas, most notably South Texas, trapped between the threats of the storm if they stayed or of deportation if they tried to leave. Immediately, the people of the Texas Gulf Coast and the people of South Asia need our assistance. A list of grassroots efforts engaged in Gulf Coast relief appears below. Please donate directly and support them generously. To respond to the disaster in South Asia, Solidarity calls on members, sympathizers and well-wishers to contribute via our website–see the “Make a Donation” button on the right hand side of the page. In Bangladesh, we are working with the Communist Party of Bangladesh-Marxist-Leninist (CPB-ML) and the Krishok Federation (a peasants’ organization). Please be sure to indicate the donation is for Bangladesh hurricane/storm relief. This is part of an international appeal. Because of climate change we will continue to see an ever-increasing frequency of deadly storms. These are one aspect of a dim future we are headed in if the working people of this planet cannot stop the fossil fuel industry and enact a just transition. This is the nightmare “new normal.” The future really is ecosocialism or barbarism.